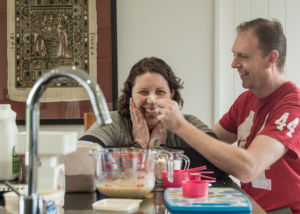 In the past few years, since her stage 4 diagnosis, Nicola has had to rely on her husband Ryan to take the load caring for their ﬁve year old daughter and looking after the house. They live on an idyllic plot of land out of Christchurch but their plans for running it as a small farm and produce business have been put on hold for the moment. But for the two of them, there’s always baking. Wen we ﬁrst talked Nicola was quick to identify Ryan as the one who provided the backbone she needs all day and everyday. She highlighted one of the things they loved doing most together was baking – but was quick to point out Ryan was the real cook. I photographed them making banana mufﬁns before their daughter got home from school,but what I witnessed was Ryan putting his heart into making his wife laugh.